Thor Gjermund Eriksen was ceremoniously handed a symbolic oversized key to his new office as chief of Norwegian Broadcasting (NRK) on Monday and had a busy first day on the job, one of the most powerful in Norway. As he made the rounds of media interviews and met the NRK troops, he admitted he faced “the steepest learning curve” of his life. Eriksen is, however, the second media professional to take on the top job at the state broadcaster, and his experience in the media business is seen as a clear advantage. 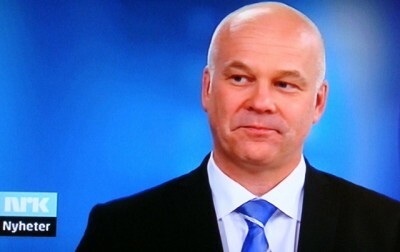 Before his predecessor and NRK veteran Hans-Tore Bjerkaas secured the job in 2007, the position of kringkastingssjef (broadcasting chief) was mostly held by politicians appointed by the government in power, now for six years at a time. They presumably had the political skills to deal with their state owner, but most had never worked in the media themselves and often were steered by their own ideology. Eriksen, age 46 from Høybråten on Oslo’s east side, also has a political background, having worked for what’s now the Socialist Left party (SV) and later for the Labour Party after studies and a half-year off to travel the world. He was both a politician at the city level in Oslo and press secretary for SV at the Parliament but wanted to be a journalist and secured a full-time job at newspaper Dagbladet in the mid-1990s. He covered politics and then had what can only be described as a meteoric career, moving on to be political editor at Aftenposten, editor-in-chief back at Dagbladet and, most recently, chief executive of Amedia, the media company rooted in the former A-pressen that owns several local newspapers and websites around the country. Many staffers at Amedia were surprised and sorry to see Eriksen leave for NRK, not least because he had just overseen the company’s transition from A-pressen to Amedia and was expected to carry it forward. “For us in the Amedia newspapers, this is not what we wanted, and the timing is extra poor,” wrote the editor of local newspaper Romerikes Blad, Thor Woje, when Eriksen’s appointment as NRK chief was announced in December. “Eriksen was the one who managed to arrange A-pressen’s long-wanted purchase of Edda Media and he was supposed to be the boss of Amedia, strengthened by the purchase process he had such a solid, strategic hand on.” Woje went on to contend that Eriksen would be missed. Eriksen seemed to get a warm welcome at NRK on Monday, and has admitted he’s “a bit overwhelmed” by the size and power of the NRK system and the important role it plays in everything from political debate to music and sports in Norway. He’s spent the past several weeks touring NRK operations, introducing himself to various employees, visiting the crews covering the Nordic skiing world championships in Italy and watching NRK employees in action during production and coverage of Melodi Grand Prix, Norway’s version of the Eurovision Song Contest. He claims his most important job will be to maintain the level of quality and operations found under his predecessor Bjerkaas, who “leaves us with an NRK that’s in order. I’m heading into the steepest learning curve of my life, and I ask for guidance when needed,” he told hundreds of NRK staffers assembled at his reception on Monday. Even though Eriksen objected to NRK’s market dominance while he worked in the newspaper business, he told newspaper Dagens Næringsliv (DN) on Tuesday that he now thinks it’s “critical” for NRK to continue to expand and succeed on various media platforms, not least online. NRK.no is a popular and widely used newssite, and NRK also has developed speciality sites covering such areas as the weather. It has more projects in store, worrying other commercial media firms whose own websites have a hard time competing against NRK both journalistically and financially. 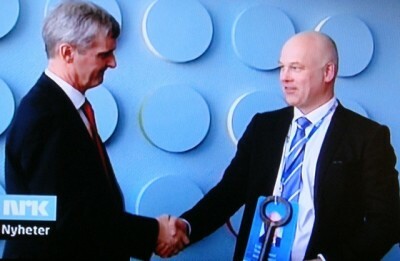 Eriksen does face many challenges in his new job, including ethical issues with its journalism, competitive threats from the national commercial channel TV2, an end to its monopoly as broadcaster of such major sporting events as the Olympics and English football, and never-ending technical innovation. Eriksen seems keen to tackle them. “No media institution that has any ambition of being important in peoples’ lives five to 10 years from now can stand still,” Eriksen told Dagsavisen. He was keen to hit the ground running.